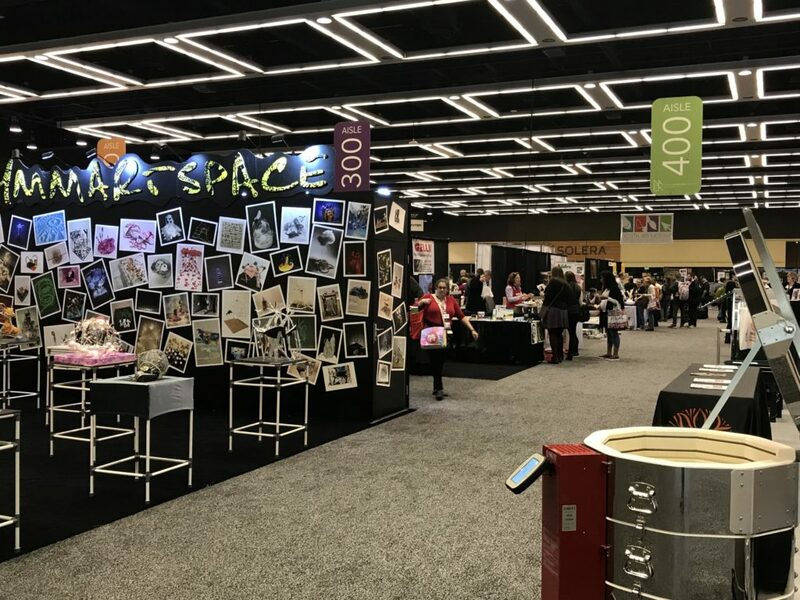 I attended my first National Art Educators Association conference in Seattle, WA this past week! 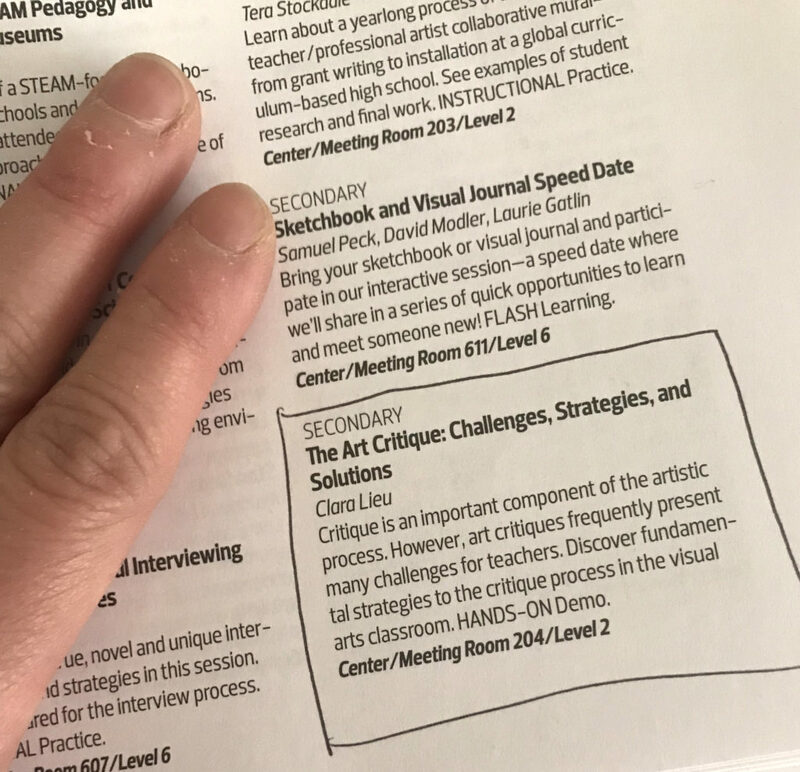 I have to admit that I was nervous, not only because I was giving a lecture on how to lead critiques in the classroom, but also because just flipping through the catalog of countless activities in 3 days was enough to make my head spin. Although I’ve given many lectures in the past, this one felt different. For one thing, I had no clue how many people would show up for my lecture, maybe there would be 3 people in the audience which is just embarrassing, or maybe it would be jam packed which would make me excited but also incredibly nervous. However, the most nerve wracking part was knowing that I was going to be lecturing to a group of art teachers. Usually when I present, I’m lecturing to students, or a diverse mix of people. 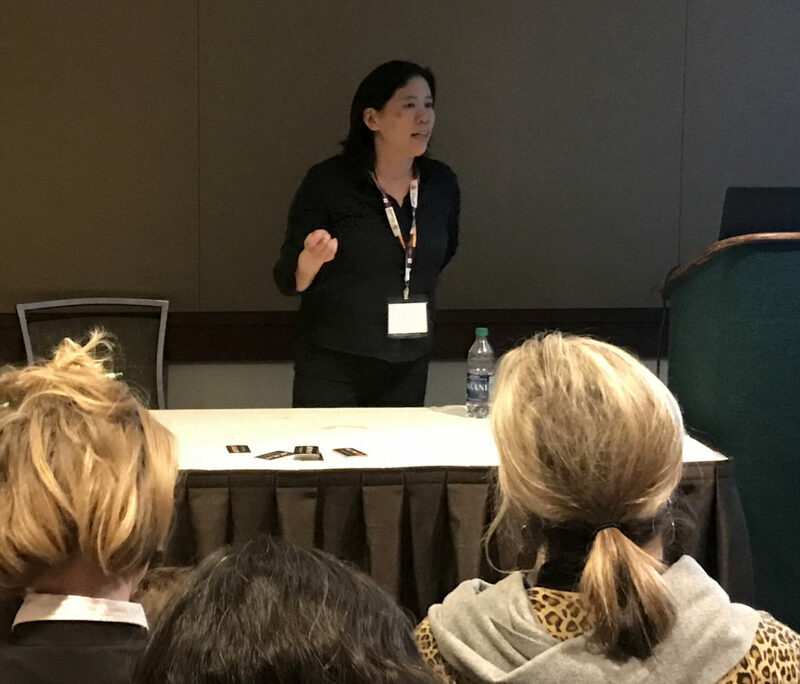 The thought of lecturing to a room of people who know my profession inside out was pretty terrifying. As I waited for the lecture to begin, I was amazed that a huge flood of people entered the room. Eventually, we had people sitting on every square inch of the floor, standing against every piece of wall space, and people peering in from the hallway trying to get in. (I’m sure this was totally a fire hazard) Some of the rooms had a microphone, and so of course, mine didn’t have one, and the room was packed enough that I nearly had to shout in order to be heard. The lecture went well, I ended exactly at the determined 50 minutes, and afterwards I felt relieved and accomplished. Many people tell me that they write out their entire lecture and reference those notes while lecturing. I’m different in that I show a slide with a word or a short phrase, and then just spontaneously make it up from there. I do the same thing when I shoot videos for Art Prof. When I write out what I want to say, it always feels forced and stiff. After my lecture, the rest of the conference felt so fun and relaxing by comparison. 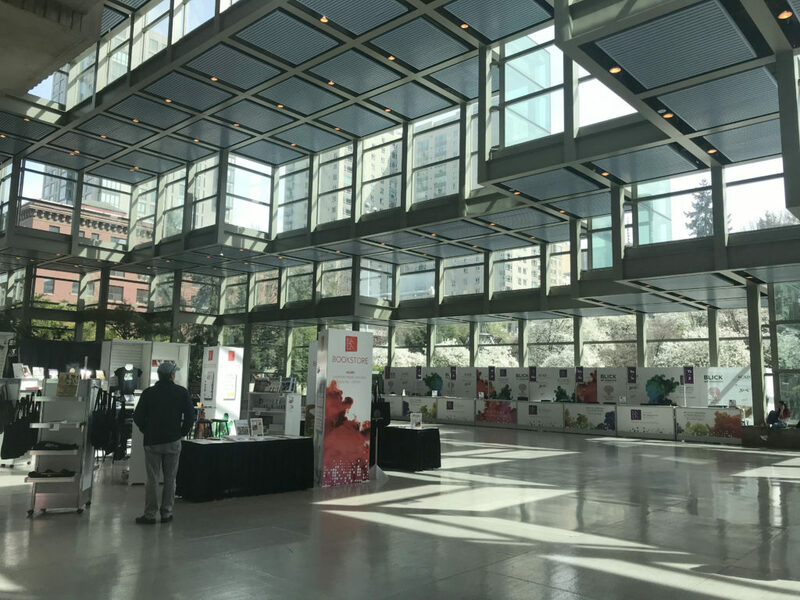 Between the exhibition hall which was packed with goodies from art supply manufacturers and retail stores and the gigantic range of lectures I could go to, I felt like a kid in a candy store. 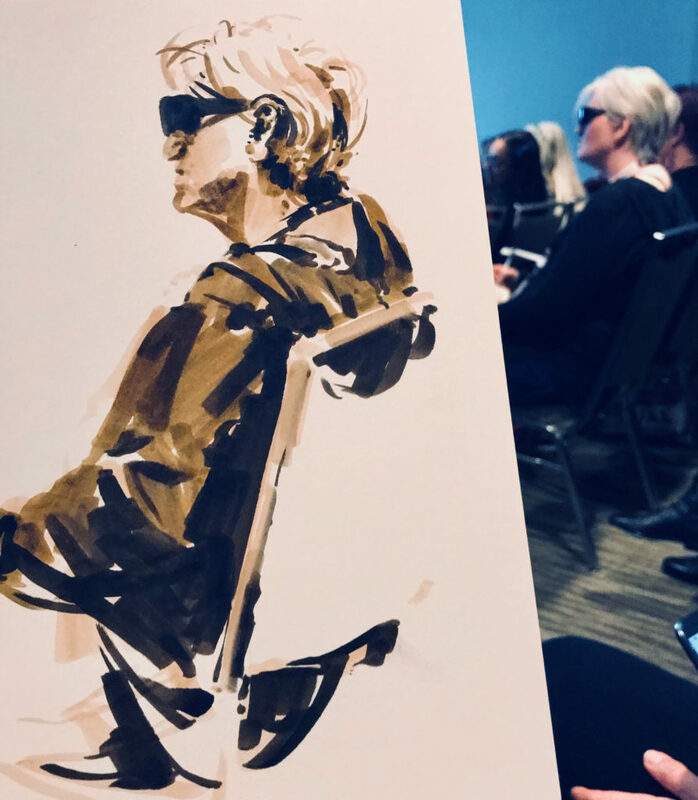 Certainly one of the highlights of the conference was meeting other art teachers I have interacted with online in person. I had dumplings and gelato with Cindy Ingram, Phyllis Levine Brown, and spoke to Joy Schultz for a brief moment, and met up with Rachel Simpson. I always had this idea in mind that meeting people in person after interacting for over a year online would be awkward, but we had so much in common that I felt like a martian who landed on a planet full of other martians. 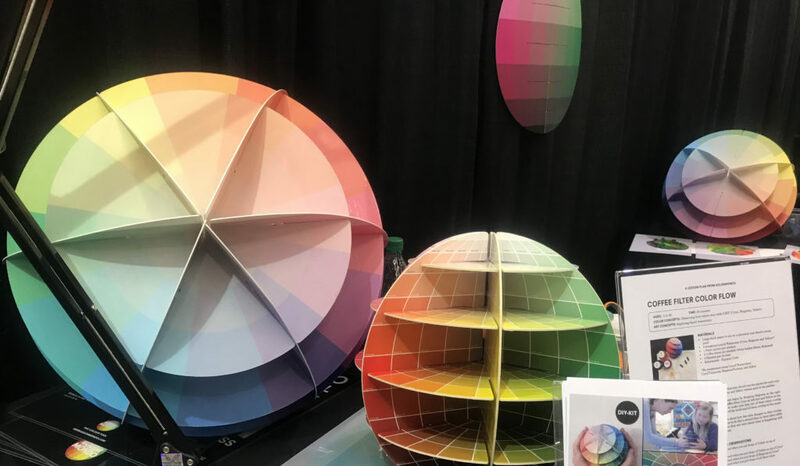 We could talk about nerdy art topics like how a retailer discontinued a specific brand of paper mache art paste, and how certain brands got moldy while others didn’t. 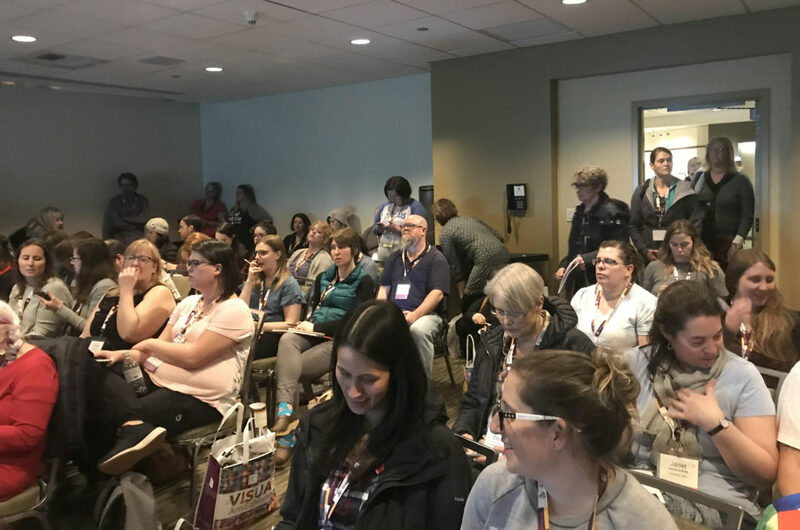 Many of the teachers I met also run their own websites and blogs so we were able to connect about engaging with our readers as well as the business side of running online resources. The exhibition hall was loads of fun, I got to meet representatives from companies like GelliArts, Copic Markers, Amaco, Strathmore. Some of the people I met were actually people I have corresponded with in the past, and it was wonderful to have this rare chance to speak to them in person, it solidifies your relationship in a way that email cannot. 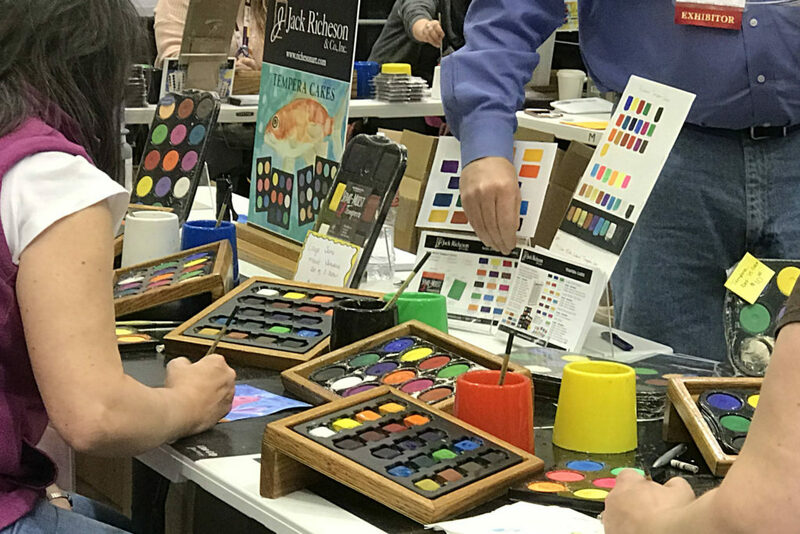 I’m usually really skeptical about new art supplies; so many are gimmicky and really not that useful, which is why I was really surprised to meet Angie and Phil at the new company Clay House Art. 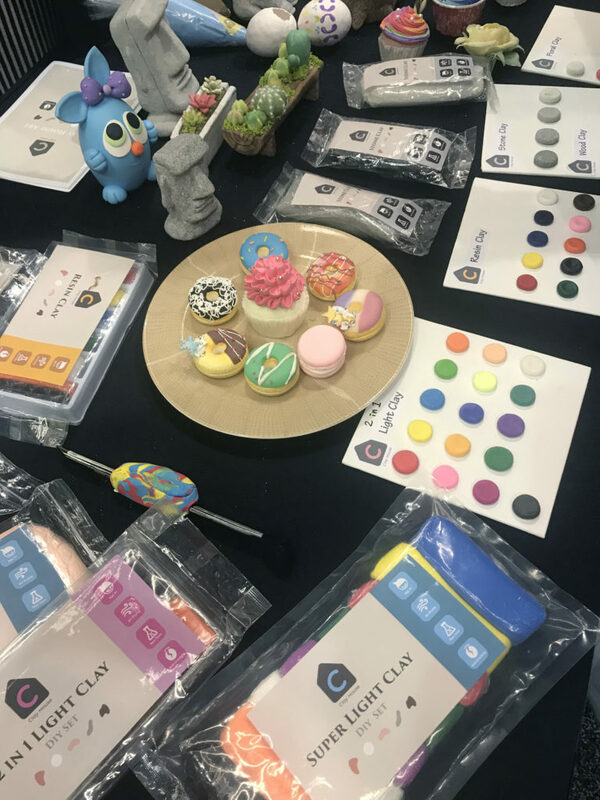 Their company started in November 2017 and they focus exclusively on air dry clay. All of the air dry clay that I’ve used in the past is a nightmare: the clay is sticky and gross to model with, and once the clay dries, it’s incredibly heavy, smells weird, and has any ugly surface. It’s the one type of clay that I refuse to use and avoid like the plague. Clay House art had a really fun variety of clays: clays that replicated the look of stone, some that looked like cookie dough, resin clay which looked a lot like oven baked clay, and even a clay that looked just like terracotta clay. What was impressive is that their clay had really lovely, smooth surfaces after drying. Touching the clay, I could tell it would be smooth and easy to model with, and the clays even had a wide range of weights. The cream clay was super lightweight while the terracotta clay had a heavier presence that seemed appropriate for the look at of the clay. I have always wanted to produce a figure modeling course for Art Prof, but the issues were that I couldn’t use ceramic clay because most people don’t have access to a kiln, and plastilene is annoying because it’s not a permanent material. For a plastilene sculpture to be permanent, you would need to create a silicone or waste mold and cast it in another material like resin or plaster. So discovering Clay House Art’s terracotta clay seemed like the perfect solution to this problem. I left Phil and Angie’s booth super excited about the possibilities. I even managed to fit in some quick sketches here and there with my Tombow brush pens during a few of the sessions. I came back home feeling rejuvenated, inspired and thrilled to implement everything I learned at the conference into both Art Prof, my teaching practice at RISD, and my own studio work. 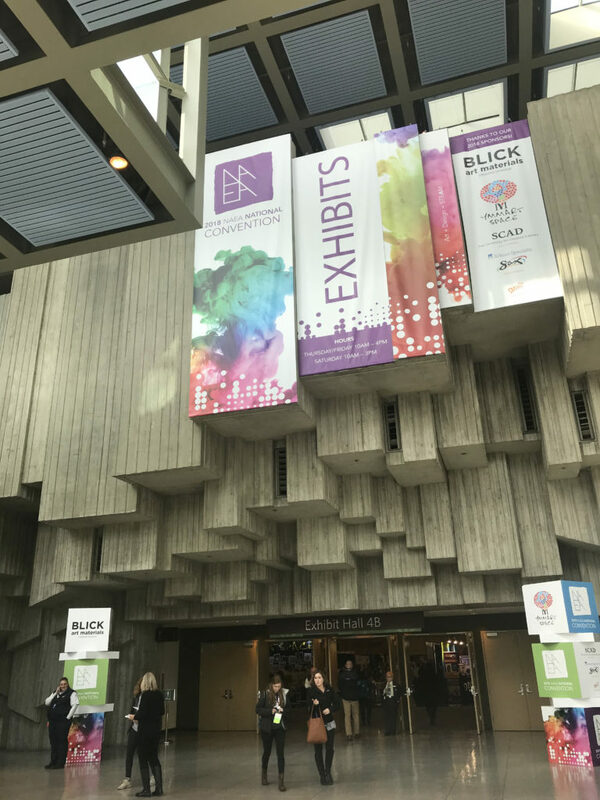 Thank you NAEA for such a terrific experience!